The Fayetteville Chamber of Commerce was founded in 1889. We boast nearly 1,200 members making us one of the largest Chambers in the state of Arkansas. Our Chamber Members range from single owner, home-based businesses to large scale employers such as the University of Arkansas. 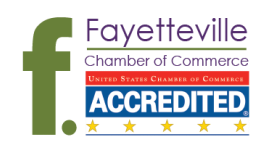 Our Chamber has earned a 5-Star Accreditation from the U.S. Chamber of Commerce which recognizes the Fayetteville Chamber as a top-performing Chamber based on several metrics of best business practices. This accreditation ranks our Chamber as one of the top in the entire United States.